Oh, Canada, Tune-In to Food Network Canada's New Series Eat St. w/ Eddie Lin Chowin' the Grilled Cheese Truck! Wednesday, April 6th. Yes, I swallowed. 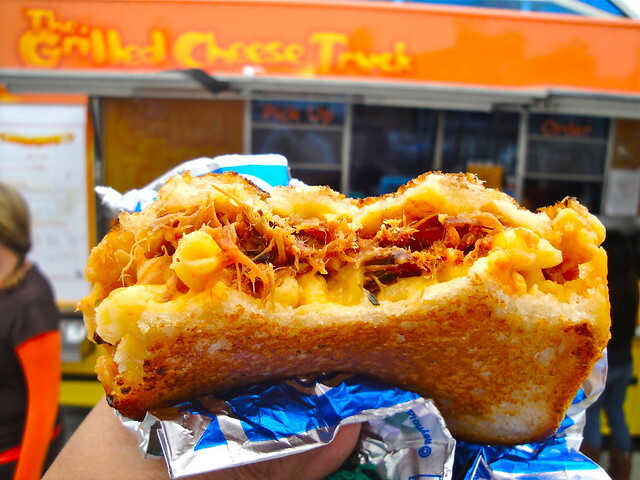 And it was damn good, that Cheesy Mac n' Rib from the LA food truck juggernaut Grilled Cheese Truck. Tune-in to Food Network Canada's new show about curbside cuisine called Eat St., premiering Wednesday, April 6, 2011 at 130PM & 930PM EST, and watch me crush this sammich! Yeah, my Canadian Deeplings, see for yourself what this food truck frenzy is all about down here in the U.S., eh? In my segment on Eat St., I have the pleasure of introducing to Canada Dave Danhi & Michele Grant's cheesy food mobile, the Grilled Cheese Truck. I mowed my way through their signature Cheesy Mac n' Rib sandwich while trying to talk on camera with my mouth stuffed! (I know, I know, tough gig.) So, I apologize in advance if my segment either comes off like a mumbling mess or grosses you out! Whatever the case, please tune-in Wednesday (if you're in Canada or have access to Food Network Canada). If you had it in your mouth, im sure that you sucked a little and swallowed alot. I am sure that you are going to do well on the show. Hey, it's Eddie Lin! From TV! You did great, Eddie. Thanks for coming on the show. Looks good Eddie. Congratulations! That sandwich looks phenomenal! Thank you. I hope I did well on the show too!! Hey, thanks very much for the review! I still haven't seen it, so I appreciate your comment! That sandwich IS phenomenal. You must get your hands on one!! Thanks for the comment.